Danbury boys and girls have a chance to sweep the boys and girls FCIAC cross country titles. But the boys will have to contend with Staples who defeated them in their regular season meet and the girls will face a strong challenge from Trumbull and Ridgefield. Danbury's Lauren Moore is a slight favorite, but Mari Noble of Greenwich just out kicked her to take 2nd at the Wickham Invitational and Trumbull junior Alessandra Zaffina has been like a shadow, finishing behind Moore a few times this season. With nine of last year's top 10 graduated, the boys title is up for grabs. New Canaan senior Andrew Malling had a monster summer of training and has competed well against some of the top runners in the state and conference in all of his races. Kabir Chavan of Ludlowe is the 2nd fastest returner from last year's FCIAC and Malcolm Going of Danbury looks healthy and brings his 1:52 800m speed and will be dangerous if he is near the lead towards the end of the race. 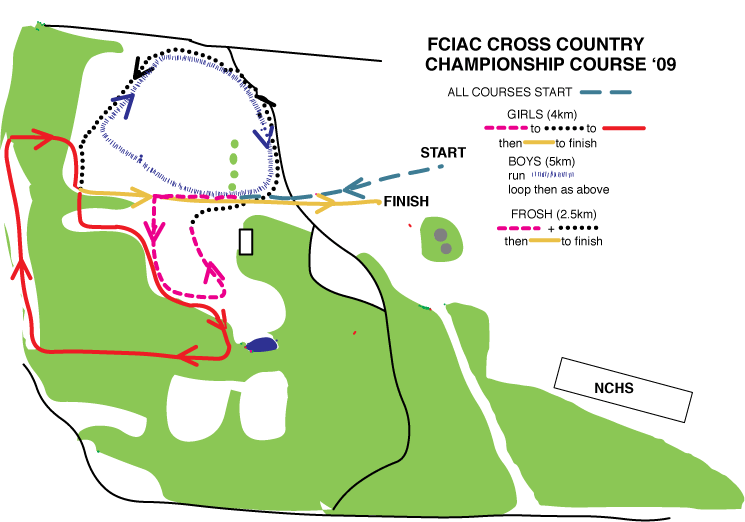 A course map can be found here.